The area that we know today as Florence County remained a region for hunting and trapping until the discovery on iron ore. N.P. Hulst and other mining engineers discovered the iron resource on the Michigan side of the Menominee River in 1873. In 1876 the Menominee Mining Company was organized, and the Chicago Northwestern officials began building the Menominee River Railway which in 1877, was extended to the Florence Vulcan Mine. Mining operations began at the Florence mine during the winter of 1879-1880 with peak production being reached by 1920. Very little timber harvesting was done in the Florence County area prior to 1865. Soon after, loggers discovered Florence County's magnificent white pine forests. The primary timber in the early logging period was white pine and limited amounts of Norway Pine. Pine was primarily cut because it floated so it could be easily transported by stream and river. By 1898 the pine was gone and loggers turned to the hemlock and hardwoods after the rairoad was forged. Farming in Florence County had its origin in the need for agricultural products by lumber companies. 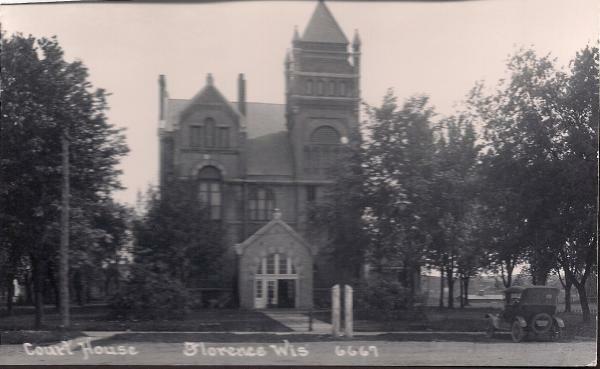 Florence County was created from the territory that included parts of Marinette and Oconto Counties, and was named in honor of Mrs. Florence Hulst, wife of N.P. Hulst. An early photo of our majestic brick building "Florence County Courthouse" that still stands at 501 Lake Street, with all its adornments from a by-gone era.